Protection and the ability to recognize the meaning in each situation adorn a date such as November 3rd. A lot of hope and optimism is set in it, as it represents the point of a savior, a place where all our difficulties are done with and the light at the end of the tunnel is seen in clarity. Honesty is the main asset of those born at this time. They should never compromise it no matter the set of circumstances that might trouble them in life. People born on November 3rd are governed by a strong direction in life that puts them on special missions when they are in tune with their heart's desires. It is important for them to not compromise their words or their personal judgment due to other people's beliefs, for this is their strong suit and something to hold on to in the time of need. They will be protected by the Universe for as long as they stay true to their emotions and could lead a prosperous life if they don’t get lost in chasing someone else's ideals and strivings. Honest and provocative, they understand what the world has to offer from a point of absolute truth, but might get misled by expectations of their surroundings and their social circles if they aren’t stable on their own two feet. "A Fellowship Supper Reunites Old Comrades"
"A Drowning Man is Being Rescued"
These symbols speak of regeneration and reuniting and are mostly about using what one has been blessed with even when things in life get dark and burdening. Those born on this date have the ability to see what hides behind the corner and need to rely on their hunch in dangerous situations, connecting with others who believe in a shared cause, to make this world a better place. On the other hand, we can see that battles need to be led and one must fall in order to rise again, and this sometimes puts a difficult stamp on the first part of their lives, until they discover where their mission lies and turn to the path of their Soul. 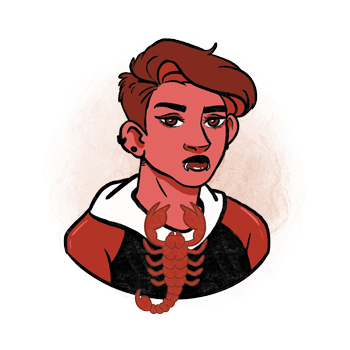 Governed by Mercury, Scorpios born on the 3rd of November feel the need to understand all the details to the bigger picture they see with ease and clarity. This allows them to separate their true goals from those that belong to others, and to express themselves in full freedom. They are to speak their mind openly, write about their experiences and publish their words, without restrictions from their group or any social circle they belong to. Their tribe is to be made out of people who have similar strivings in life and negativity in their surroundings could drain too much of their energy until they learn to listen behind the words, and put their own wellbeing first. Even though we mostly see mental efforts and the importance of the mind in planetary settings of those born on November 3rd, to acquire true strength in life, they need their heart cleansed and regenerated from issues that bruised them. To truly see what they were meant to see, and express their emotions the way they should, they must connect with their emotional core and open their Soul for contact with others that is pure, sincere, and filled with empathy and adoration. This will lead them through relationships that point out their weaknesses, until they embrace their sensitivity as their real strength in life and set clear boundaries towards those who hurt them. They need a partner who will listen without prejudice and someone to help them understand their own path in life, so they can share gifts they’ve been blessed with. In time, they find that the depth of their mind isn’t enough to live in balance with others and find ways to release piled up emotions that taint their judgment and lead them into relationships that have been harder than they needed to be. Once they achieve flexibility and allow themselves forgiveness for mistakes made, they will be ready to make full contact with someone who sparks the light in their heart. 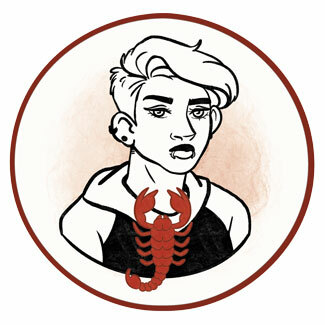 A Scorpio born on November 3rd excels in teaching and all forms of education. They may become travelers of the world, but it is important for them to understand the value of their roots, so their efforts to work towards a goal don’t scatter and make them unstable. With faith and devotion, they make incredible progress in fields of philosophy and theology, as well as all areas of expertise that require one seeing the bigger picture and giving aim to people who are lost. Gabbro, also named the blizzard stone, is a very good choice for people born on November 3rd. It is a crystal that allows recognition and acceptance of Earth's changes, bringing one in tune with the cycle of life and knowledge from upper realms they carry in their heart. It balances intense and diverse energies of people born on this date, until they are ready to fully appreciate their contact with the Divine and bring true faith down into their routine and their everyday life. The choice of a birthday gift for someone born on November 3rd shouldn’t be too difficult, as they are joyous about presents in general. Still, their love for giving might put you in a tricky position as they might expect everyone to put in the same amount of emotional effort into choosing their gift as they would in return. Think about their interest and beliefs, give them something to learn from, or expand their horizons by taking them to places they haven’t had a chance to visit. Organize a gathering on a rooftop or take them paragliding, keeping an accent on heights they strive for. Studious, understanding and wide, they are optimistic and have the strength to regenerate and endure through hard times until they find their happy ending and meaning for all issues that life threw their way. When lost in other people's beliefs and convictions, they lose focus and get scattered doing too many things at once, distracting themselves from dealing with their inner world. This puts a distance to their relationships and sometimes makes them aggressive, cold-hearted or energetically drain. In 1900 Adolf "Adi" Dassler was born, a German inventor, cobbler and entrepreneur that founded Adidas, building one of the largest manufactures of sportswear and equipment. Along with his two brothers, he was known as the "laundry boy" in his childhood since they delivered clean laundry throughout the city. In 1921 Charles Bronson was born, a prolific American actor mostly cast for roles of vigilantes, police officers and gunfighters. Raised in a poor family as one of 15 children, he had to wear his sister's dress to school at some point due to lack of clothing. In 1930 Lois Smith was born, an American actress known for her career spanning for seven decades and her supporting roles in Dead Man Walking, Twister and Minority Report. In her acting career, she has also taught, directed and written for the stage. 1493 – The island of Dominica is first sighted by Christopher Columbus. 1534 – The first Act of Supremacy is passed by the English Parliament, making King Henry VIII head of the Anglican Church. 1789 – The first District Court in the United States is opened in New York. 1868 – The first African American is elected to the U. S. Congress but is never seated due to an electoral challenge. 1903 – Panama separates from Colombia with the encouragement of the U. S.
1957 – Sputnik 2 is launched by the Soviet Union, with a dog named Laika on board.